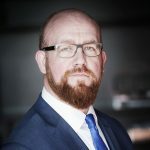 Paul C Dwyer is an internationally recognised cyber security expert with over two decades experience and serves as President of ICTTF International Cyber Threat Task Force, Co Chairman of the UK NCA National Crime Agency Industry Group and Deputy Chair of the (Organised Crime Task Force) OCTF for the PSNI at Stormont NI. A certified industry professional by the International Information Systems Security Certification Consortium (ISC2) and the Information System Audit & Control Association (ISACA) and selected for the IT Governance Expert Panel. A prolific contributor to the industry and media, Paul is a professional public speaker and industry evangelist. Most recently, he has presented in Westminster Parliament to the UK Defence Committee on countering cyber threats. He has also authored a number of industry works including an Executive Cyber Security GRC training course adopted by the UK financial service industry. As an industry networker Paul is a member of a number of distinct groups including the IoD (Institute of Directors), IIEA (Institute of International and European Affairs) and the IRM (Institute of Risk Management). He has worked extensively around the world and trained with such organisations as the US Secret Service, Scotland Yard, FBI, National Counter Terrorism Security Office (MI5), is approved by the National Crime Faculty and is a member of the High Tech Crime Network (HTCN). Paul is a world leading Cyber Security GRC authority and leads Cyber Risk International in providing advisory services to organisations throughout the globe including Fortune 500, law enforcement and military.